Facebook announced a flurry of news related to its App Links open, cross-platform solution for application-to-app linking, which it initially debuted at its F8 global developer conference in San Francisco April 30: More than 3 billion unique App Links have been created; an App Links blog has been launched; analytics are now available; Windows Phone support was boosted; and support for the referer_app_link was added for Android. We’ve partnered with Mixpanel, Parse and Facebook to provide an easy way for developers to measure their App Links traffic. Today we are launching updates to App Links to make it easier for developers to analyze and segment their mobile traffic. Developers who implement the Facebook SDK (software-development kit) will now be able to use App Links to access information about their apps. 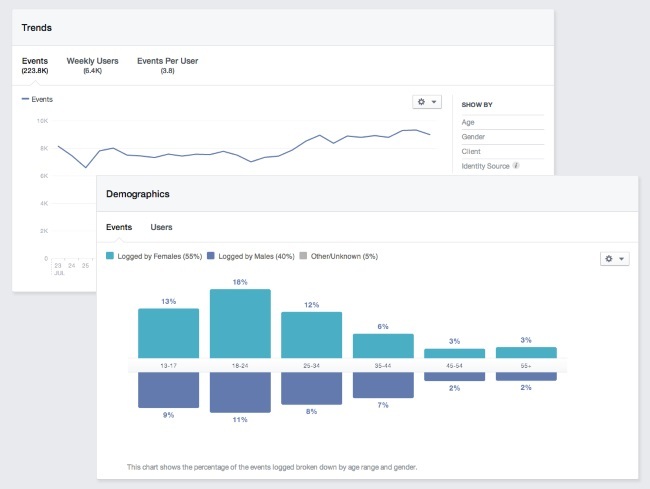 This is done through Facebook App Insights, where they can understand the demographics and usage patterns of people using their apps. These updates will help developers better understand the value of App Links and create better experiences for people using their apps. ‘al_nav_out’ — this event is raised in the referring app when it sends out an App Links URL. ‘al_nav_in’ — this event is raised in the receiving app when it opens an incoming App Links URL or intent. ‘al_ref_back_out’ (iOS only) — this event is raised in the receiving app when someone navigates back from the receiving app to the referring app by tapping on the navigate-back bar. App Events allow you to understand engagement with your app with just a few lines of code. You can get started with this by downloading the latest version of the Facebook SDK, which also includes the Bolts SDK, and logging your app launch events with Facebook. Once your app is updated to send App Events for your App Links, that data can be accessed by either browsing under the events you have logged in App Insights or by the Graph API. These three App Events will be added with a prefix of “bf_” to indicate that they are forwarded from the Bolts Framework. From there, App Insights will help you understand the makeup of people engaging with your app. This includes anonymous and aggregated demographic information like age, gender, language and country, among others. In addition, we’re adding calculation of time spent in your app for incoming App Links that also shows the referring app. We expect that these improvements will help you better understand and optimize usage patterns for your app. For more detailed instructions on how to set up analytics for App Links, please see the documentation. We announced at F8 that Windows Phone was one of the platforms we supported, but today we’re announcing a series of enhancements that will make it much easier for App Links to work with Windows. As of today, we will now support Windows 8 apps, as well as universal Windows apps. For more information on how to get started with App Links for your Windows and universal Windows apps, take a look at our documentation. The referer_app_link is an important property for analytics, as it helps you better understand the source of your traffic. We’ve now enabled support for this on Android as an optional property in the al_applink_data field. After the initial release of App Links support in the Bolts SDK, we’ve been looking for ways to enhance this support and easily provide actionable data to developers. With that in mind, we are pleased to announce Parse support for the App Links analytics hooks that are now available in the Bolts framework. This Parse support takes App Links events and translates them into Parse Analytics custom events. You can then go to your app’s analytics dashboard to view detailed App Links data — for example, how often outbound App Links have been clicked or how many times your app has been opened from another App Links-enabled app. This new open source, lightweight library is available for iOS and Android. You can simply download the jar or framework file and drop it into your project that’s already using the Bolts SDK. You can also download the source directly from GitHub.